Travel back into old world Italy in this private villa overlooking the Mediterranean. Set on the idyllic island of Ischia, setting of the "Talented Mr. Ripley" and the HBO series "My Brilliant Friend," Villa Beatrice offers an authentic Italian experience with all the benefits of modernity. Throw open the shutters and lounge by the pool while indulging in the bounty of the land. The villa is a destination in itself while also serving as a home base for travelers looking to enjoy day trips to Naples, the Amalfi Coast, Positano, Capri, Procida, Pompeii, Paestum and beyond. Villa Beatrice is built into the side of a hill allowing all three floors access to sun-drenched terraces and spectacular views. Surrounded by rolling gardens, the villa delivers views of the sea where the islands of Capri and Procida (setting of the beautiful film "Il Postino"), the ancient island castle Argonese, and the great volcano Vesuvius dominate the horizon. The setting was stage to ancient and storied histories tracing back to the Bronze Age. Visitors can't help but imagine ancient Greeks trading in the Port of Ischia below, Romans arriving to bask in the island's healing waters and pirates dueling over the castle Argonese. Step back in time and bask in the same Mediterranean sun, sip the same lovely local wine and inhale the delicious jasmine drifting on the breeze. Ischia, "the lesser known Capri"
Ischia is a volcanic island in the Gulf of Naples, Italy. It's known for its mineral-rich thermal waters. Hot springs bubble up at the nearby Maronti Beach, and the world class spas. Roman ruins lie beneath the sea floor at Cartaromana Beach, which has views of the medieval Aragonese Castle, linked to Ischia by a stone bridge. Nearby, 18th-century Palazzo dell’Orologio houses the Sea Museum, devoted to Ischia’s fishing tradition. Villa Beatrice is built in the traditional Mediterranean style, with thick walls, tile floors and a plethora of windows which flood the house with natural light and lovely breezes. All three of its floors offer walk out access to surrounding terrraces and garden paths. The villa features a library for studying, six bedrooms for dreaming, a kitchen, living and dining room for gathering and large terraces for dining, a pool for sunbathing, a hammock for lounging and lemons, olives, oranges and herbs for indulging. In short, Villa Beatrice has it all, and it delivers an unmatched, blissful experience. The villa is uniquely built into the side of a hill, so that all three floors have access to private, sun drenched terraces, shaded areas, and the surrounding land and scenery. 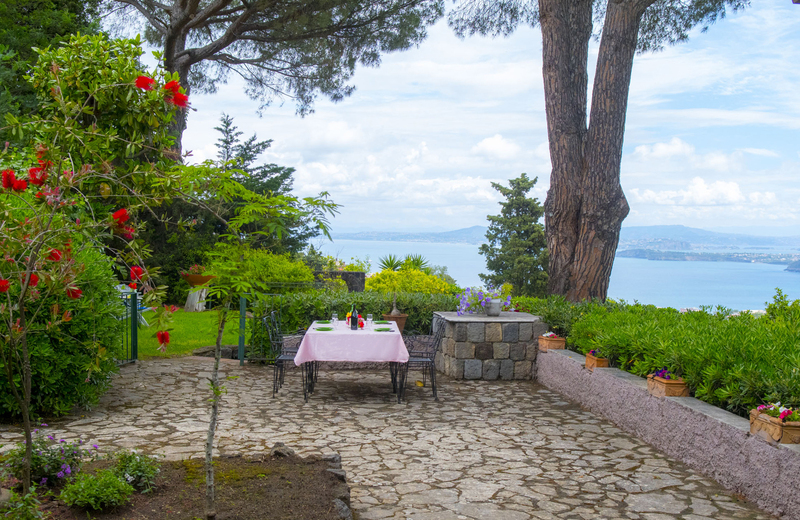 Villa Beatrice is incredibly well situated allowing for spectacular views from all sides. Its 4,500 square meter gardens afford privacy and freedom of movement from the best vantage point on Ischia. Its established landscaping includes olive and lemon groves rolling across the land. The walls are covered with climbing roses, jasmine and bougainvillea and other plants including lavender, rosemary, mint and many other herbs that line the meandering paths wrapping around the house. Villa Beatrice's pool is an escape in and of itself. Wrapped in olive and lemon groves and draped in Jasmine and Bougainvillea, the pool looks out over the Aragonese Castle and features a fountain and massaging jets. It is simply spectacular, offering the perfect spot to sip local wine, practice yoga or indulge in a massage. The pool's water is a lovely temperature and monitored closely ensuring only the minimum levels of chlorine are used in it. The challenge for Villa Beatrice guests is deciding just which spot offers the best view. There are so many options overlooking the Bay of Naples, home to the Aragonese Castle, Procida, Capri and Mount Vesuvius. All three floors of the villa offer easy access to views that date back to the Bronze Age, they are views you will never forget. Upon your arrival you will be greeted with a hamper full of local wine, fruit (largely from the Villa Beatrice gardens,) cheese, mineral water, bread, coffee, olive oil, eggs, jam and butter. WiFi is included in your booking as is a cleaning service that will clean the villa daily. Click the button below to learn more about included services. In addition to the ammenities included in your stay, there are several additional services you might be interested in learning about including a driver, masseuse, beauty stylist, babysitter and catering. Villa Beatrice is two hours from Rome, and a ferry ride from Naples. For details on travleing to Villa Beatrice, advice on car rental, driver reservations and other logistics, follow the link below. Villa Beatrice was designed, built and furnished by a career diplomat whose various posts and extensive travels enabled him to gather an eclectic collection of statues, tapestries, rugs, furniture, and ornamentals which now decorate the house. The paintings are largely European, with a well-rounded collection of Mediterranean gouaches forming the nucleus. Many are of the mountain Vesuvius, destroyer and preserver of Pompeii and Herculeum. Villa Beatrice is an exquisite combination of old world charm and modern amenities. Spacious (there were 10 of us), comfortable and elegant, the Villa was perfect. The outdoor space, from the outdoor, spotless infinity pool to the stone patios & flower laden lanai, to the spectacular view of the sea -- simply magical. The multi-level floor plan made the space seem even larger and afforded a great deal of privacy. The Villa exuded warmth, as did its caretaker, who appeared each morning with pastries, just picked fruit and homemade wine. The website does not do justice to this Villa. The villa is exquisite and exceeds the expectations in every way. We had the most wonderful time there, and one that we will all remember for a very long time indeed! The wedding was perfect at sunset by thr floodlit pool, Tina and the young lady that came with her to do the makeup were fantastic and all of us had a wonderful experience having them make us all “beautiful” for the event. Daniel, thanks again so much for the opportunity to enjoy what will be one of the most special and memorable times of our lives at your villa. Thank you also for all your help and guidance with the contacts for the hairdressing, restaurant etc, so appreciated. We absolutely loved Ischia, what a beautiful slice of heaven it was. The villa is spacious and well tended, and was very comfortable for our group of 10. It is dramatically nestled into the mountain on four levels, with spectacular views of the nearby islands and the mainland from the rooms, patio, terrace, and pool. The stunning view from my bedroom and bathroom would almost overwhelm me. We all found that the building architecture, its period furnishings, authentic artwork and fascinating library allowed us to step back and relax and enjoy the riches of Italy in an earlier era - but with all the modern conveniences! We went to different spas on the island (our favorite is Poseidon) as well as the public beach (Maronti), and it was all fantastic. The food everywhere was wonderful, including at the spas and right off the sand of the public beach. Through the years we have been to Villa Beatrice with teens, young children and seniors and all of us had a great time at this villa and on the gorgeous island of Ischia. Warning: Stop reading now if you just want a villa to sleep in and nothing more. Because Villa Beatrice is a memorable Holiday all its own. The pictures on the website are just a "tease" a precursor as to the what Beatrice is in person. You will fall in love at first sight with the architecture of its exterior, the Neapolitan style and grandeur of its interior, the almost angelic glow that surrounds the whole villa at every turn. You'll want to unpack and just stay forever. Especially when Villa Beatrice's caretaker for 40 years gently knocks on your door with his warm smile and graciousness and some "home made" vino in one hand and fresh figs and oranges in the other right off Beatrice's trees. With eight people spread over six roomy and oh so comfortable bedrooms we had time to all be together in the oversized living room and adjacent outdoor area or to "get lost" on any number of verandas, terraces or loggias. Villa Beatrice is a private villa for rent on the island of Ischia, off the coast of Naples, Italy. Formerly the vacation home of the Italian ambassador to Pakistan, the villa is home to art, books, tapestries and more collected from around the world. The villa has been passed on through the same family for generations.